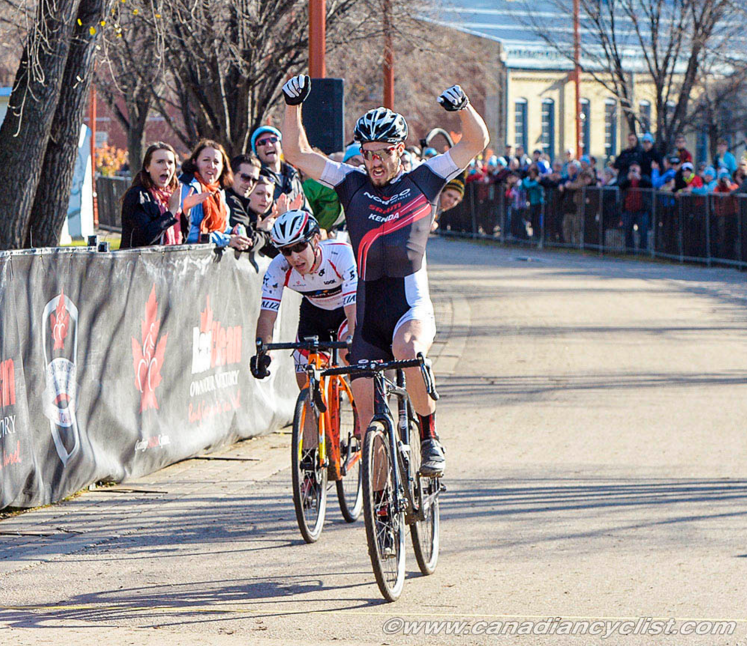 Cyclocross National Championships 2015. Winnipeg, Manitoba. What a wild week and an even more wild weekend to cap it all off! Mid October is always a lovely time of year with the leaves changing colours, cyclocross season in full force and midterms attempting to drown students one textbook at a time. Lucky for me I only had four midterms the week leading into nationals. Let’s start a week before. Racing Firemen’s Park Cross in St. Catherines would be my last local cross race before nationals. A lovely event as always, with special appearances from Mike G and Ben Perry. After the race I went back to school, pounded a RedBull and hit the books (Give My Brain Wings). Engineering Economics was first on the list on Monday night. After a successful Econ. exam it was time to cram study for the big one: thermodynamics. On Tuesday I made it a priority to get out for a ride even though I’d sacrifice some study time. Wednesday would pose to be a little more challenging. Fluvial Processes and Thermodynamics midterms were on Thursday morning back to back: 0830-1120. I had to cut my ride a little short on Wednesday as I was seriously concerned I didn’t know enough to pass Thermo. At this time I have no idea how I did on either of them – still waiting on marks. However, I will say this much, I opened my books to start studying for Fluvial Processes about 45 minutes before the exam at 8:30am, after assuming guaranteed death by thermodynamics. There was a reason for my very last minute Fluvial Processes studying: you can make up words, you can’t make up physics. Since they both went reasonably well I am a very effective crammer #LiveOnTheEdge. Wait! We aren’t done. After 4 days of very little sleep I went from back to back exams into a Material Science lab, then went home to pack my clothes for nationals and then jumped on a plane to Winnipeg. Wonderful timing! Now, for you math stars out there, we are still missing 1 exam right? Correct. That would be my Statistics for Engineers exam. Well, my professor is a beauty and let me take it with me to Nationals (I would have been absent otherwise). I ended up writing this exam quickly after arriving back in Ontario on Monday. Simple. Easy. Seamless. Nevertheless the week leading to nationals was full of stress and anxiety. I have never been so happy to make it to a bike race – even though it was rain and like 4 degrees. This was my first time to Winnipeg seeing I missed last CX season. Lovely area, great course, neat layout, confusing city – just my observations of the area. The course was wicked; neat features, sand pits, the dreaded run up wasn’t as bad as I thought and no barriers. After riding a few laps with the CX legend Evan McNeely and leg press legend Andrew L’esperance it was apparent that I would need to brush up on my cross skills in less than 24 hours. Not an issue, I’ve been cramming all week. Race day was awesome, the sun had come out, birds were already hundreds of miles south, frost had hardened the course and I slept 12 hours the night before. This was going to be a good day. I could feel it since I was nervous but excited. I decided to start my warm up a bit early – get some extra training in you know. After hitting some efforts, flexing every time the competition went by and peeling off my knee warmers, it was time to roll to the start. The start was going to be critical with multiple technical turns in the early half of the course. I took that critical section in a choke hold…aka: I was in the lead. Here; we; go. Keeping it pinned, making the competition work to catch on, only Danick Vandale was able to come across to me. This is where the race would be made. We would have to duke it out. Danick had a wicked acceleration. He caused me much pain coming out of tight turns but we both rode smooth and fast. During the race there were attacks, however, no separation was ever made. On the last lap I happened to be in the lead. I was ok with this as it gave me control over the pace and played to my tactics. I chose what areas of the course we were going to go fast and I was able to put the slinky effect in play. The slinky is when the rider in the front can conserve more momentum than the rider following because they have first choice at lines and speed around corners while the rider following has to follow. I chose lines that would allow me to accelerate sooner upon exiting the turn. This causes the follower to accelerate harder to hold the wheel. Another critical thing for me last lap was to get to the run up before Danick. I was not the fastest runner, I needed the advantage of leading that run. It worked for me because I had a few bike lengths separation after the run up, but I knew it wouldn’t last. I pinned it until Danick caught back on, then I took a breath, and at the pits (~450m to go), I lit it up. I caught Danick off guard going from so far out. It forced him to shoot some bullets to catch back up. I knew that with a national title at the line holding the sprint for that long wouldn’t be an issue for me. On the final straight he made his move, coming out of my draft and pulling up beside me. I caught his advancing front wheel out of the corner of my eye and dug deeper – that little extra bit of fire reserved for special times like this burned with a furious few pedal strokes, just enough to ensure the win. I don’t even remember breathing. I crossed the line first. Raw anger, excitement, pain and passion erupted as I crossed the line hands in the air and pounding my chest (Sagan and I share the same name – must have been instinct). I cramped about 15 seconds after crossing – may or may not have been induced by chest pounding. Hats off to Danick Vandale for a great ride! The man is a true cyclocross rider and I look forward to racing with him in the future. Additionally, Trevor O’Donnell deserves a special thanks. With no points from last years nationals I lined up behind Trevor. We had a word, he got the whole shot, life was good. Thank you to Kevin Haviland, Kevin Simms, Johnny Bates (the one in the dog hat) and of course Emma Wiechula. Needless to say the bros did a great job and we kept everything tight and on track; Evan, L’espy and Q, well done. Sunday’s Manitoba Grand Prix UCI CX C2 Race was a bit of a dud. No legs. I’m not even mad.